Elvis Week 2009 Guide - Misc. 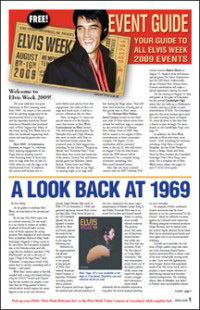 All the fans who follow Elvis Week 2009 from home can still check out the 2009 Elvis Week Event Guide that will be handed out in Memphis with the latest details on events, products, Elvis news and more. Click here to check out an online copy of the Elvis Week Event Guide (please note, this is a large file in PDF format and may take several minutes to download). All the fans who are lucky enough to be in Memphis or on holiday, you can keep up with the latest ElvisNews.com updates on our mobile site at www.ElvisPresley.mobi. This site is created especially for mobile devices.